← How well can the government spy on us via satellite? Having exhausted ourselves with a very extensive visit to Seville, the very next day we hopped on a train to our last stop: the lovely Southern city of Granada! This was an essential stop, as the whole motivation for our Spain trip was to visit niece-in-law #1, who was doing a semester abroad in Granada. While en route, I had some fun experimenting with panorama photography to capture some of the lovely Andalusian countryside. 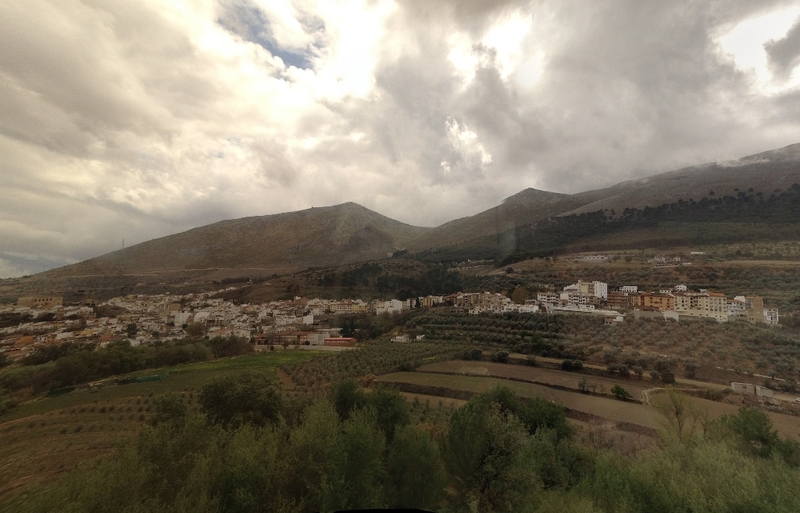 Panorama of the Southern Spain countryside, created by stitching together two photos taken from a moving train. I can’t believe it actually worked. Granada, like Seville, is a beautiful city with a rich and ancient history, as we would see for ourselves on our only full day there. The present-day city was founded in the 11th century , during a civil war that marked the end of the unified Moorish caliphate but resulted in independent Moorish kingdoms sprouting up. The ruler of one of these kingdoms opted to move his residence to the high ground of present-day Granada, where it would be easier to defend from attacks. He moved into a Jewish hamlet already present there, and the city grew rapidly in size. The city remained Muslim until 1492, when it became the last city to fall in the 800 year Christian Reconquista of Andalusia. Though Seville and Granada share similar histories, they are very different in appearance and atmosphere. 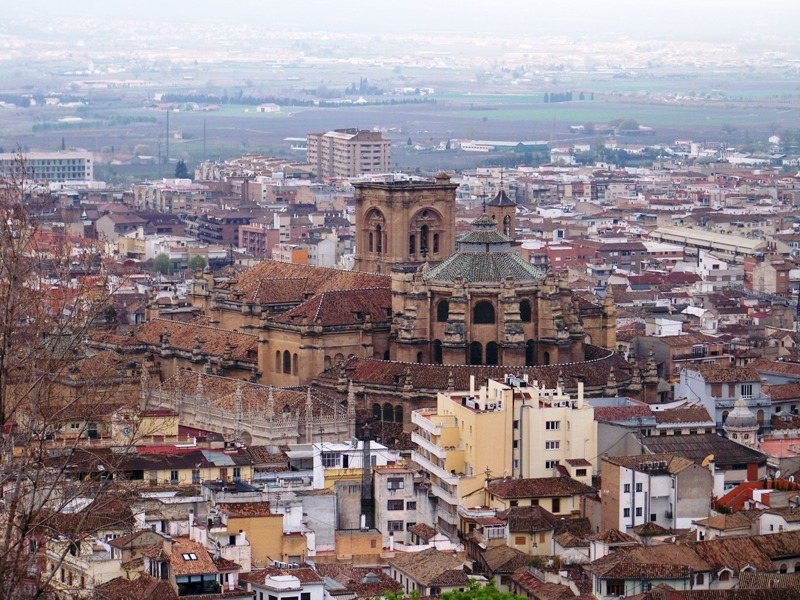 Granada’s hilly terrain in the shadow of the Sierra Nevada mountains is quite a contrast to Seville’s open plain. They both have lovely neighborhoods and beautiful architecture, however! The Basilica of Nuestra Señora de las Angustias, patron saint of Granada. We arrived relatively late to Granada, and spent the afternoon just wandering around and indulging in a little shopping. Well, the wife & her family shopped, I followed — I didn’t mind too much because of all the lovely sights to see! The 18th century Disputación, the Palace of the Provincial Government. 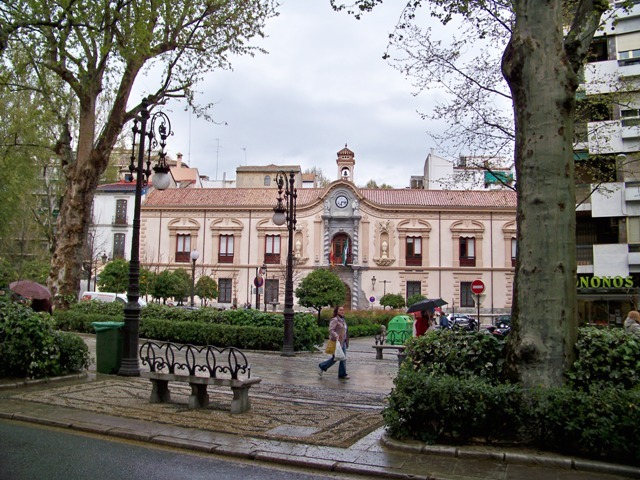 Along the way, we passed through the Plaza de Campillo Bajo, a charming square that clearly serves as a focal point for a lot of the city’s inhabitants. 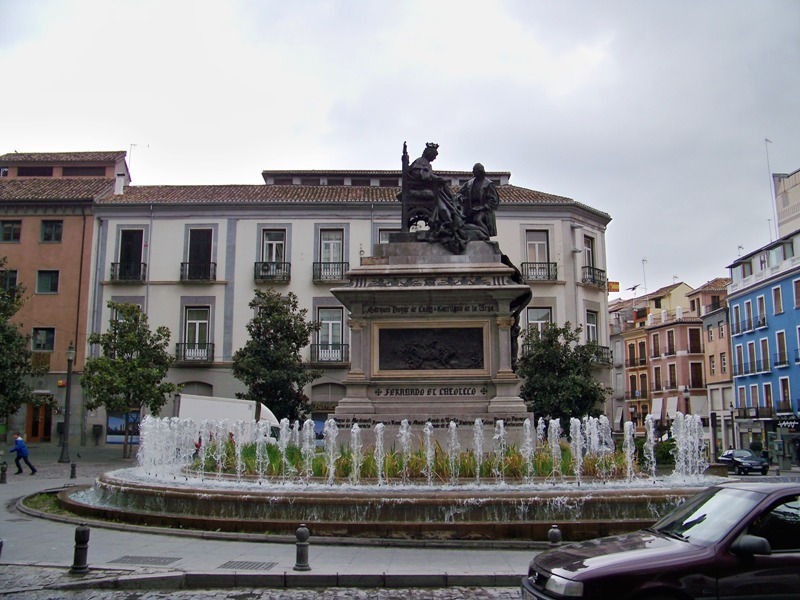 Fountain of the Plaza de Campillo Bajo. The fountain would look even more stunning at night. Before the sun set, however, we stopped for dinner at the Plaza de Bib-Rambla, NIL #1’s favorite hangout spot in Granada. In the back-right corner of the photograph you can see the tower of the Cathedral, whose construction was begun in 1523 and finally completed nearly 200 years later, in 1704. 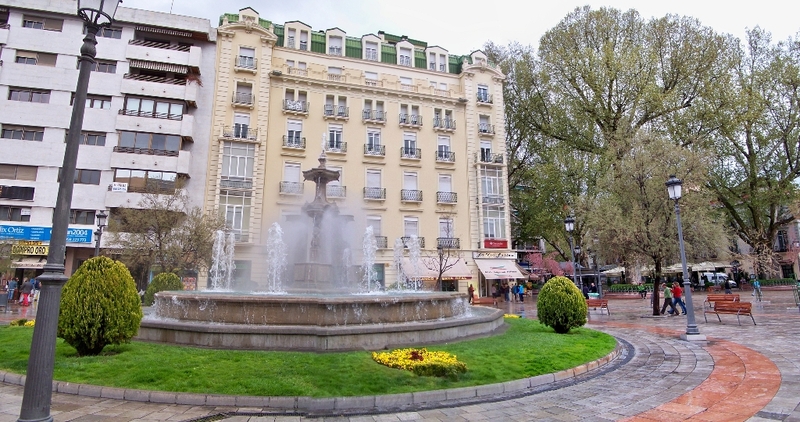 In the center of the plaza is the Fountain de los Gigantones, built in the 17th century and dedicated to Neptune. As night finally arrived, we made our way back through the Plaza de Campillo Bajo on the way to our hotel; the fountain there had taken on an almost unearthly appearance, resulting in one of the best photographs I took during the entire trip. 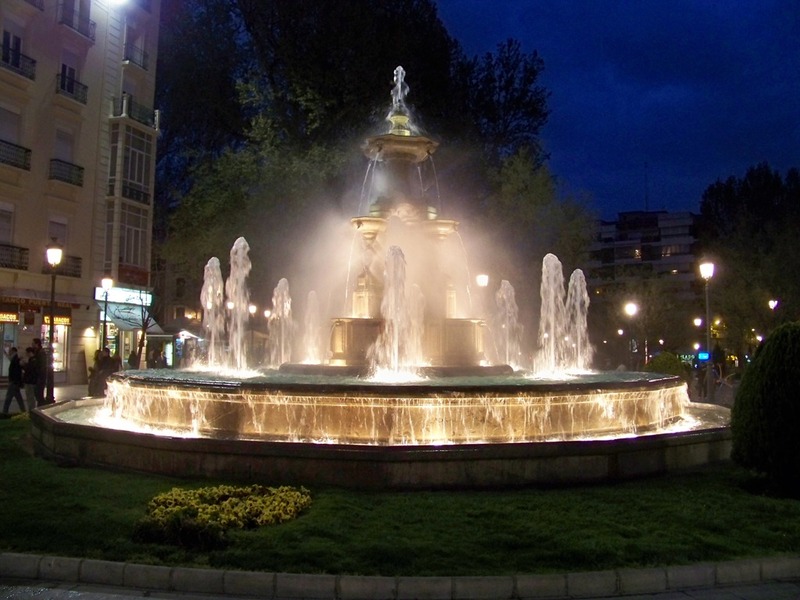 The fountain of the Plaza de Campillo Bajo, at night. We made it a relatively early night, because we were planning a big excursion the next morning: a trip to the Alhambra, a magnificent Moorish city-palace and one of the wonders of southern Spain. It is so popular, in fact, that individual tickets sold out for the day of our trip well in advance — even planning our trip a month early, my wife was only able to get us tickets via a guided tour group. “Alhambra” literally means “the red one”, and likely refers to the red clay of the surroundings upon which the fortress was built. However, a Moorish historian provided the alternative explanation that it received its name because it was constructed at night, by torchlight. The Alhambra has a complex history, and the site was occupied and built upon by many rulers and peoples over centuries; traces of many of these occupants have been almost completely lost. 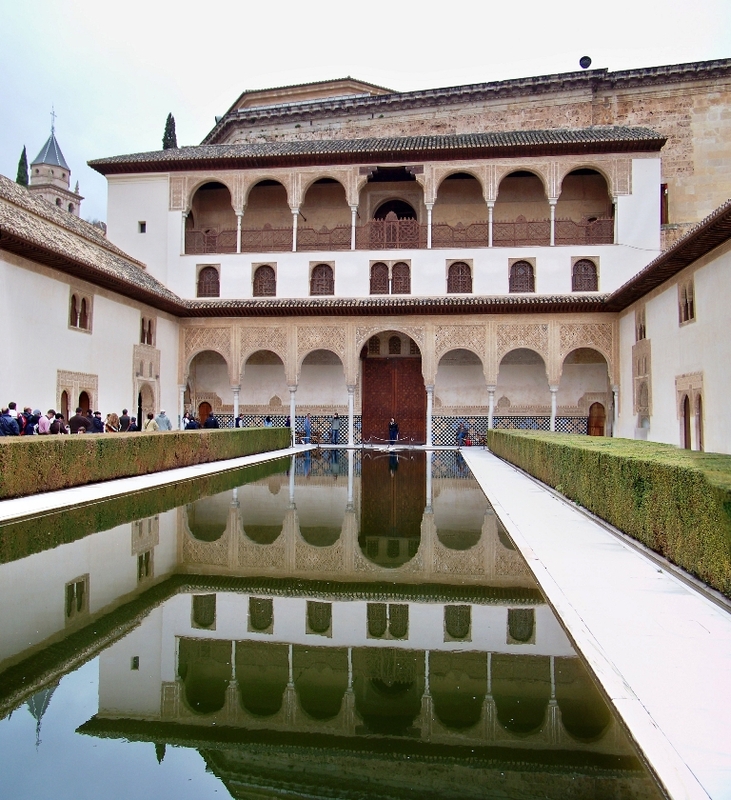 Construction of the palace-city truly began in earnest with the arrival of Mohammed I ibn Nasr, founder of the Nasrid dynasty, in Granada in 1237; construction of the palace began the next year. It was expanded by numerous Moorish rulers over the next century, but was finally lost in the Reconquista in 1492 when King Ferdinand II and Queen Isabella I took the region by force. Later rulers added their own embellishments to the palace-city, resulting it being a mix of Moorish and Christian styles, much like the Alcazar of Seville (discussed in part 6). It also suffered its share of deliberate destruction: in 1812, under orders of Napoleonic French, a number of towers of the Alhambra were destroyed. As I’ve noted previously, Napoleon’s invasion cast a long shadow over Spanish history. The Alhambra is broadly divisible into two distinct sections: the walled palace-city itself (the Alhambra), and the Generalife, a summer palace built during the reign of Muhammad III in the early 1300s. 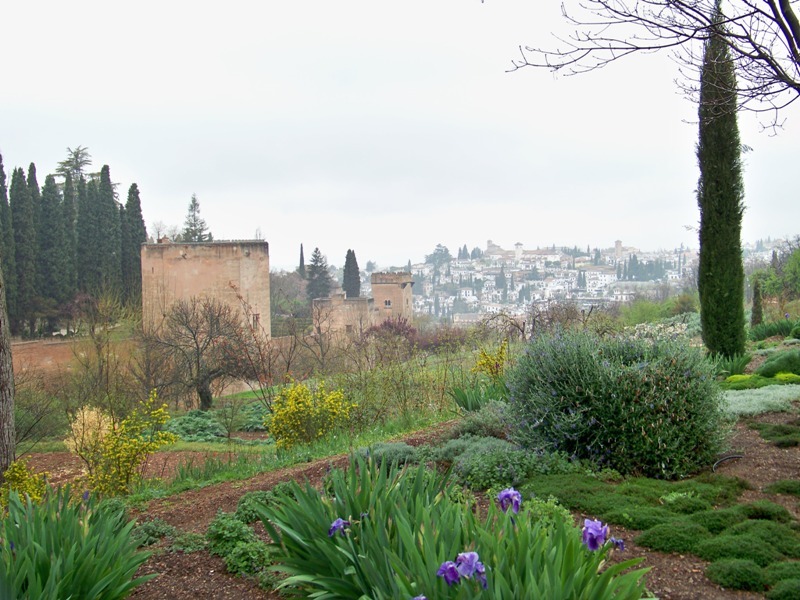 The Generalife consists of gardens and a palace that reside outside the walls, providing a nice view of the Alhambra and the city of Granada itself. It is there that we started our tour. It had rained heavily during the morning and a haze hung over the city, making it almost look like an impressionist painting. View of the walls of the Alhambra and Granada from the Generalife. Our tour took us quickly into the summer palace itself, where we were treated to the lovely Patio de la Acequia (Court of the Water Channel). The Patio de la Acequia, in the Generalife. From the upper floors of the palace, we were able to get an excellent view of both the Alhambra and the city of Granada. 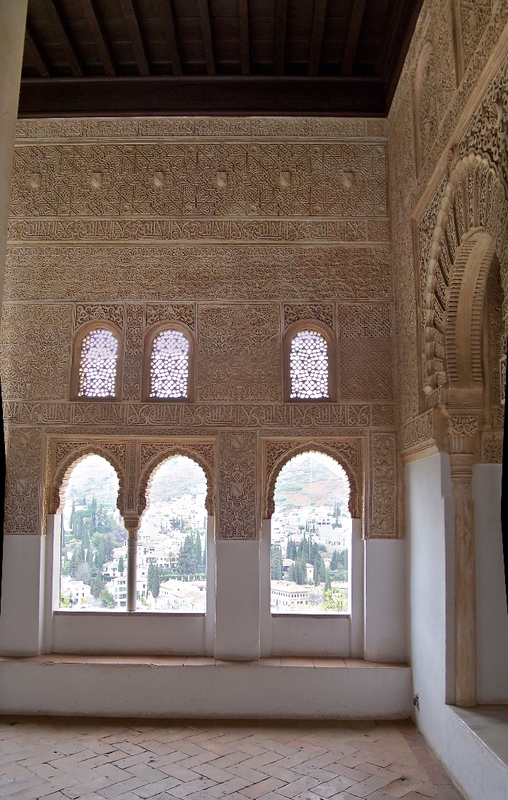 Panoramic view from the Generalife Palace. The views were beautiful; the Nasrite art that decorated the sightseeing rooms was equally captivating. 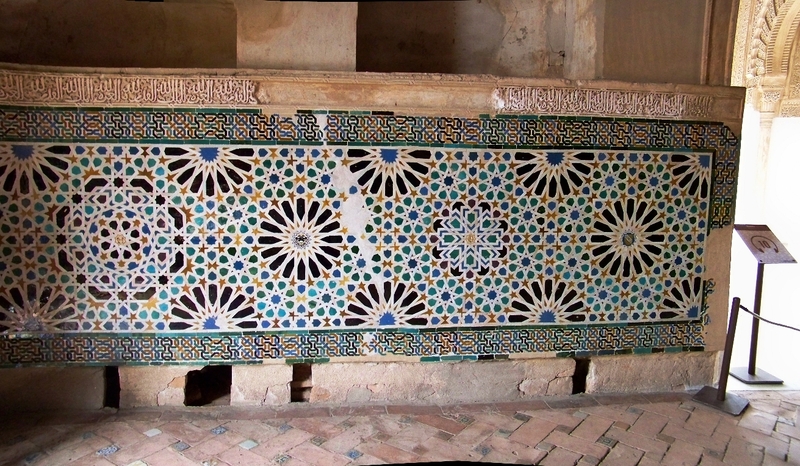 Panorama of a Nasrid style room in the Generalife. Back outside of the palace, the tour group stopped for a restroom break; this gave me an opportunity to take some more views of the city, which resulted in one of my other favorite pictures of the entire trip. 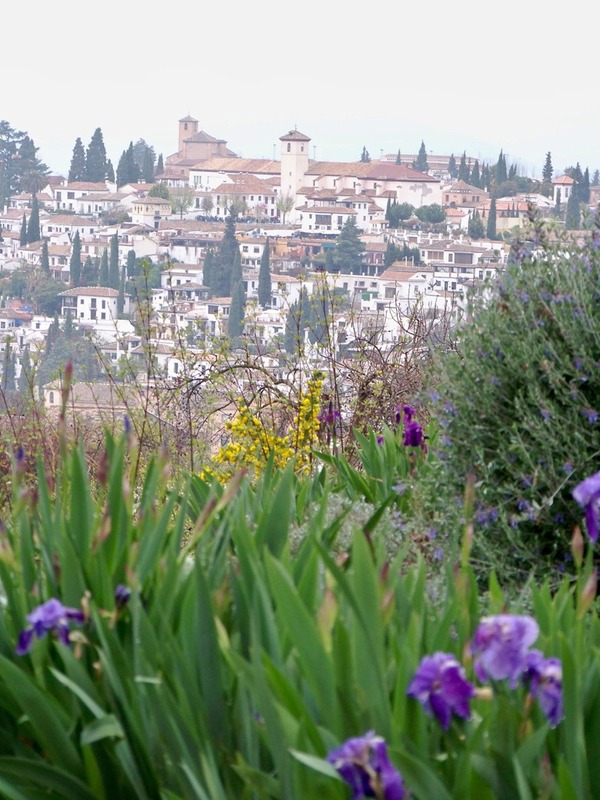 A view of Granada from the Generalife. After our break, we passed through the outer walls and into the palace-city itself. I took one more series of panorama shots from the outside to show where we were going. Outer walls of the Alhambra and Granada. 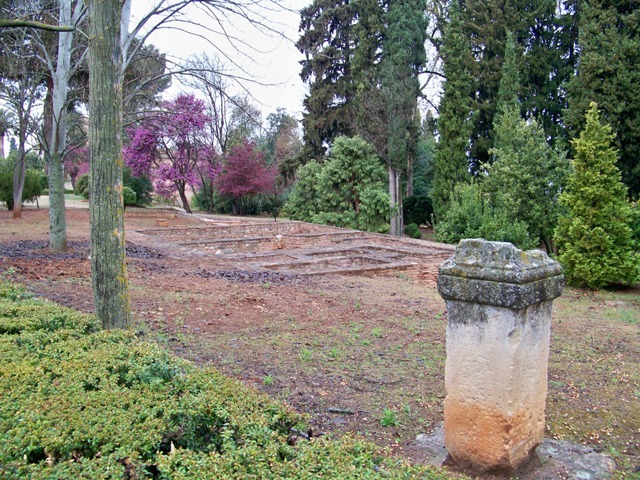 As I have noted, many early parts of the Alhambra were destroyed or allowed to fall into disrepair in later years; now the foundations lost buildings are archaeological sites. We passed some of these as we entered the walls. Old foundations within the Alhambra. The next building we crossed was of much more recent construction — relatively speaking! The Convent of San Francisco was built in 1495 on the site of an older Moorish palace at the request of Queen Isabella. Now it serves as a luxury hotel. The former Convent of San Francisco. Buildings are not the only thing of interest in that area of the Alhambra — the foliage was quite spectacular, as well. 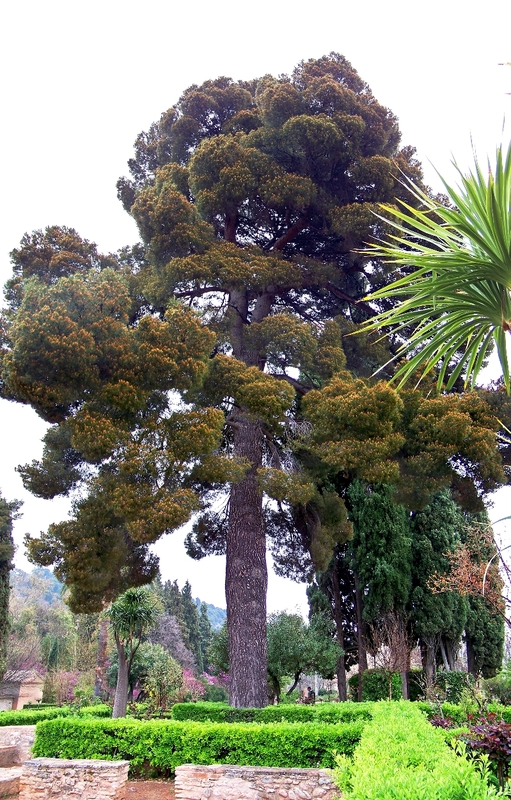 A tree in the Alhambra. Our next stop was the Palace of Carlos V, whose construction began in 1526. Curiously, it was left unfinished and remained without a roof until 1960. 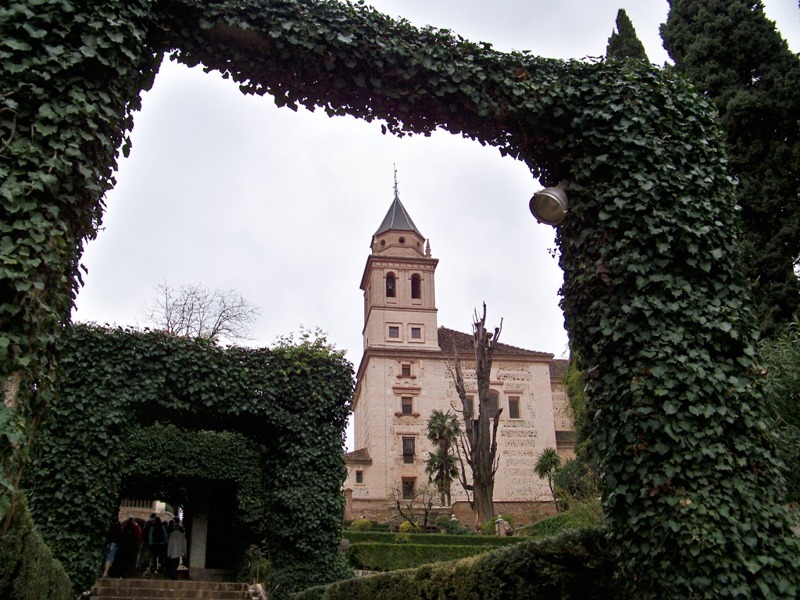 It is a good example of how new occupants of the Alhambra imposed their own style upon the complex. The Palace of Carlos V, exterior. The center of the building is still open to the air, and consists of a circular courtyard surrounded by columns. Two museums are contained within the palace today. 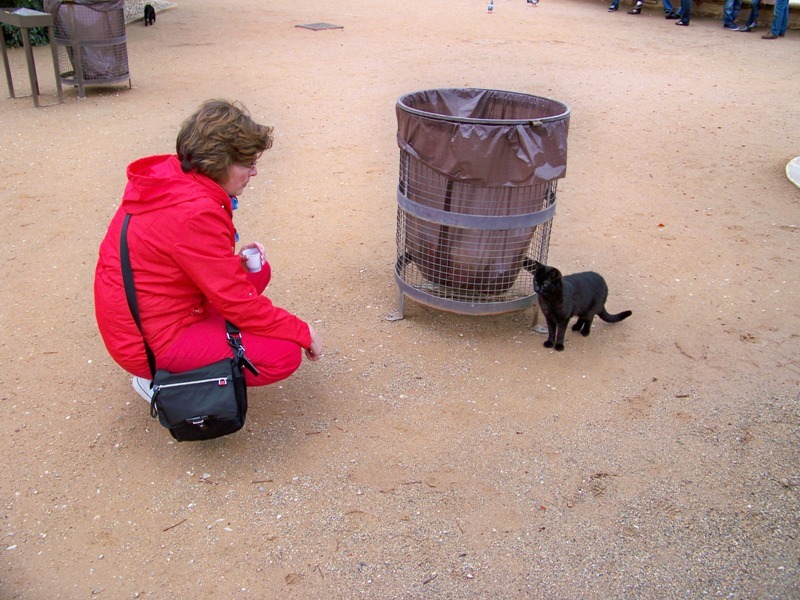 Central courtyard of the Palace of Carlos V.
We stopped outside the Palace for another bathroom break; while we rested, my wife took the opportunity to play the cat whisperer with the famous cats of the Alhambra! My wife playing cat whisperer! 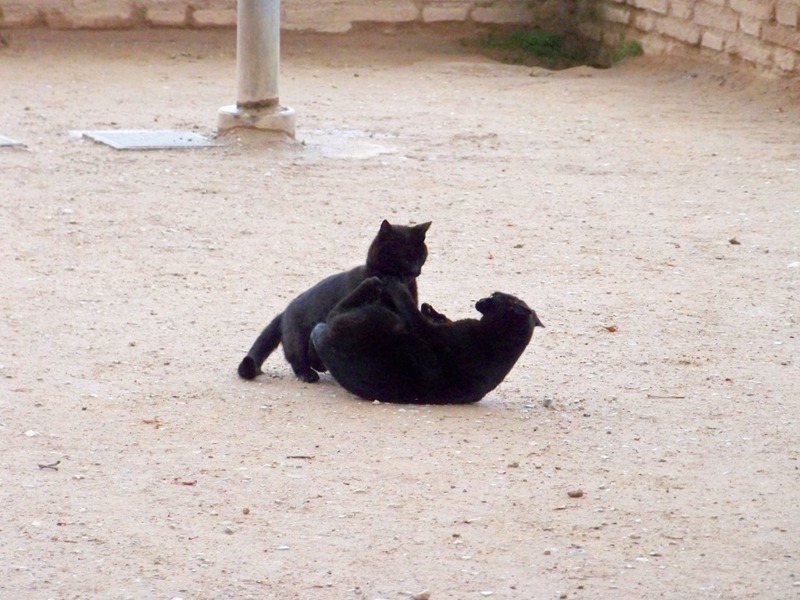 The Alhambra has a large population of feral cats. 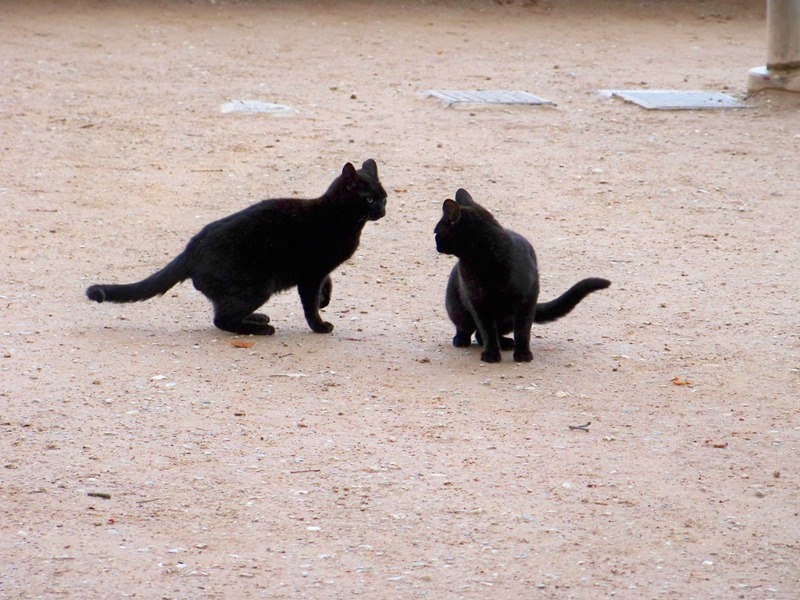 We would see them quite often around the palaces, frolicking, begging or just lounging in the sun. After this break, we turned to the most imposing structure of the Alhambra: the Alcazaba, the defensive keep of the city and the oldest standing part of the city-palace. 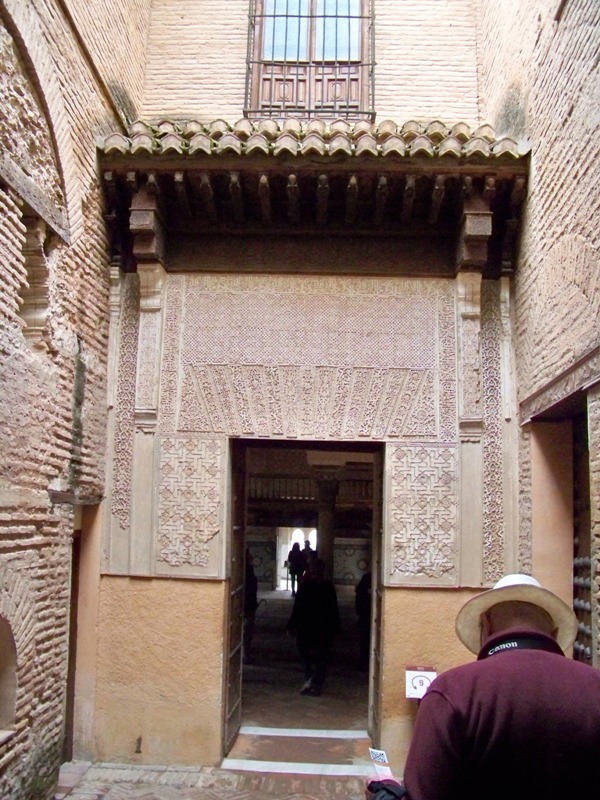 The entrance to the Alcazaba. For those who are familiar with the Assassin’s Creed series of games, I should note that I couldn’t help but imagine Altair the assassin scaling the craggy walls of the fortress! 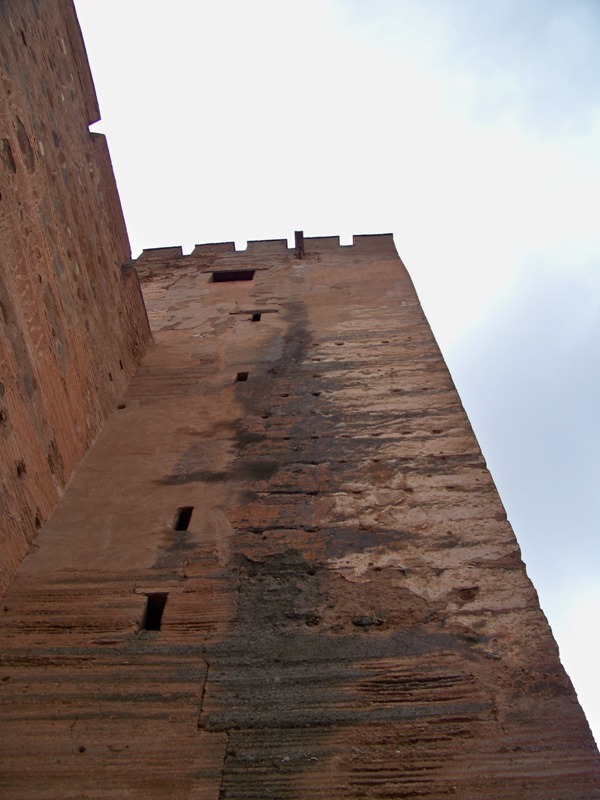 A tower of the Alcazaba. This would be a dream wall for Altair to climb. The view of Granada from the Alcazaba was spectacular, with the mountains behind. A panorama of Granada, from the Alcazaba. Another view of Granada from the Alcazaba. There was also an excellent view of the cathedral from the Alcazaba. The Cathedral of Granada, as seen from the Alcazaba. 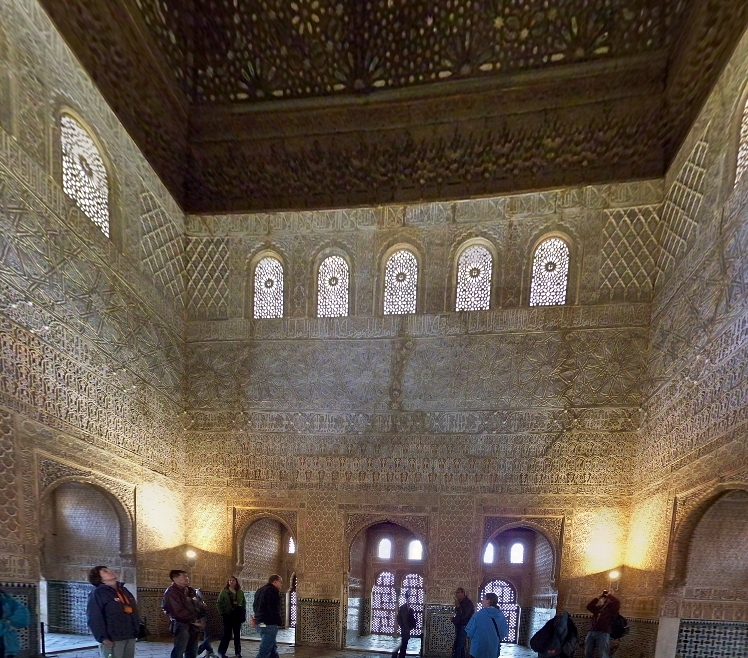 At last, it was time for us to see the centerpiece of the Alhambra: the Nasrite Palaces. Entrance to the palaces is strictly regulated and we could enter — and only enter — at a time specified on our ticket. There are multiple palaces within the Nasrite Palace complex. The three main ones are the Mexuar, the Palacio de Comares, and the Palacio de los Leones. Our visit started in the Mexuar, the oldest of the palaces which served as a meeting and audience hall. 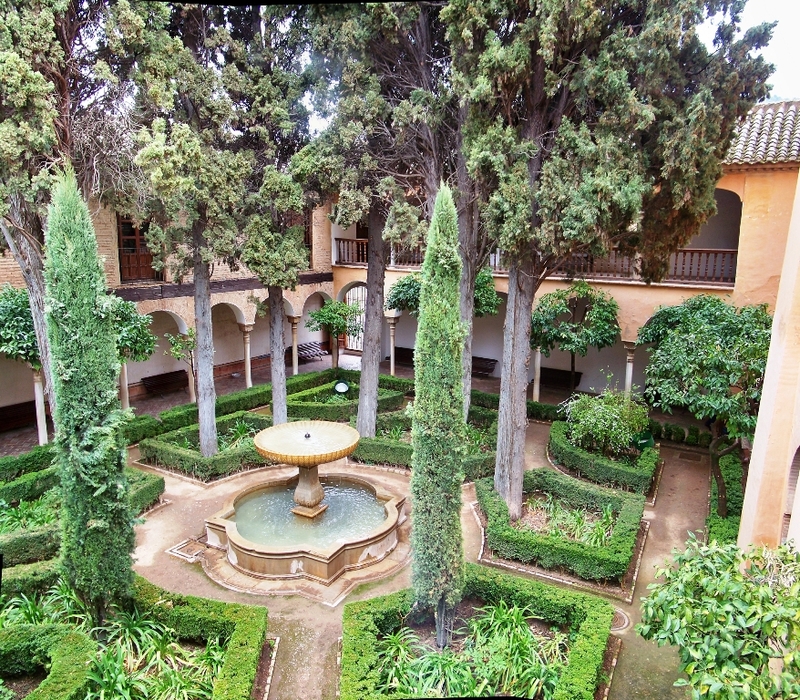 The entrance courtyard of the Sala del Mexuar gives a hint of the elegance to be found within. Entrance courtyard to the Sala del Mexuar. The Sala del Mexuar itself is a hall that was actually used as a throne room by some kings! It was difficult to get a photograph of the whole room, but even part of the ornamentation was worth recording. Detail of the Sala del Mexuar. 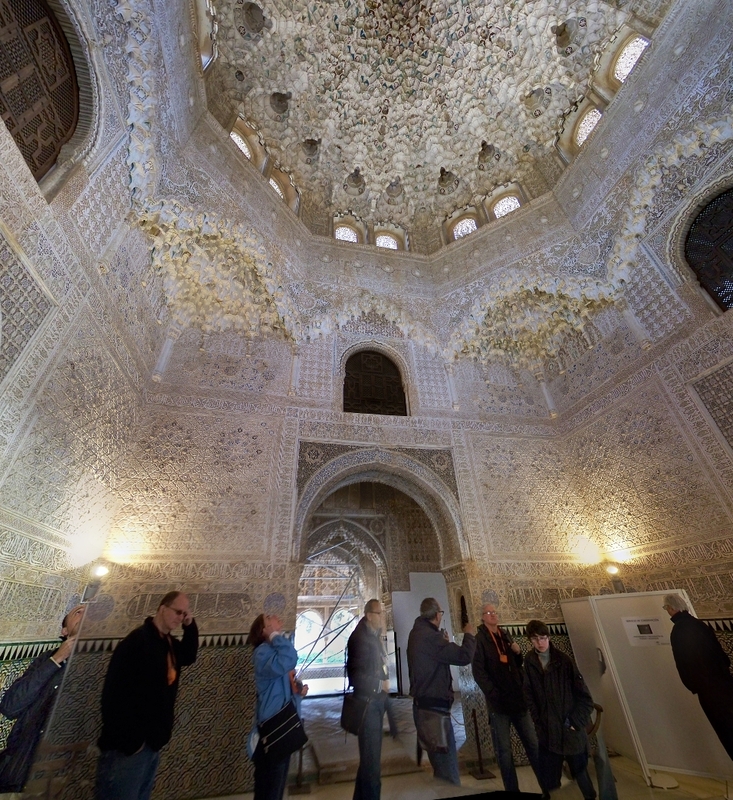 The room was lined with Islamic tilings; this sort of artwork inspired Roger Penrose to develop the mathematical theory of quasicrystals, which I have discussed in a previous post. Tiling in the Sala del Mexuar. The Sala is actually larger than it used to be; in the mid-1800s an oratory adjoining the Sala was incorporated into the room during restorations; this oratory also exhibits lovely wall decorations. Oratory of the Sala del Mexuar. 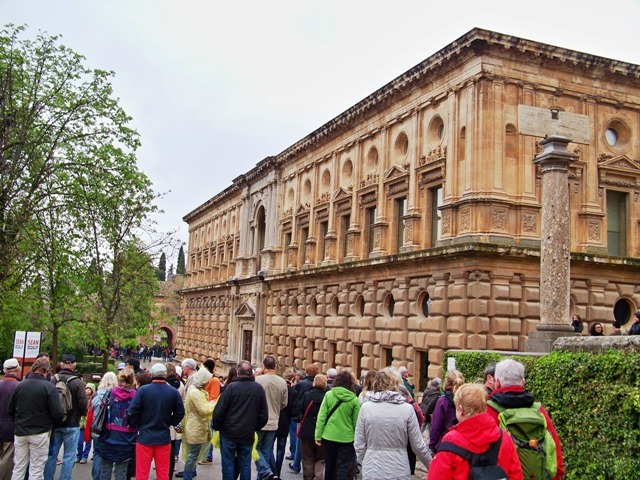 We left the Mexuar and crossed a courtyard that leads into the Palacio de Comares, which was built during the reign of Yusuf I and served as a residence for the sultan and his family. The facade of the Palacio is a magnificently beautiful piece of architecture. Facade of the Palacio de Comares. Turning back towards the facade of the Mexuar, I noted that, in the absence of human inhabitants, other creatures had found a home in the palace. 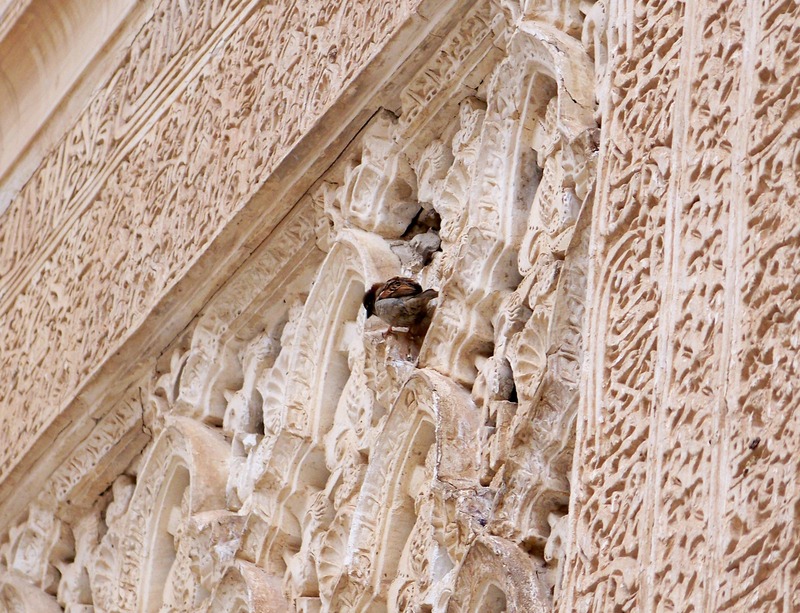 A sparrow making a home in the Alhambra. 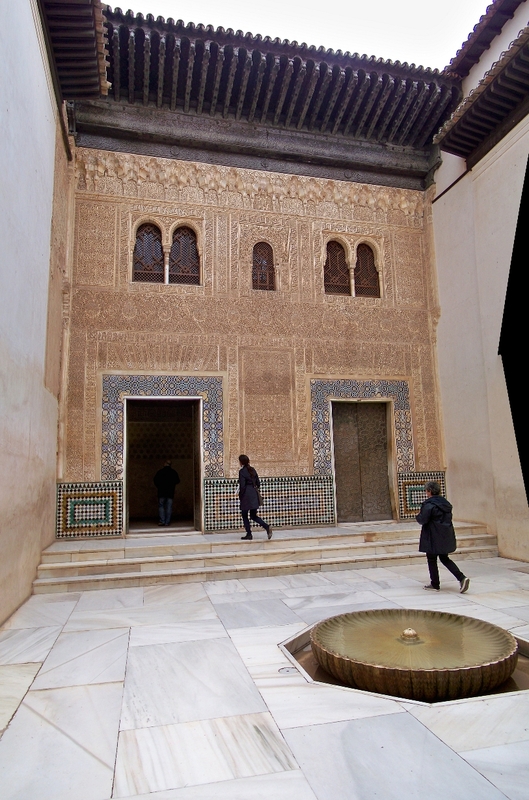 From the entrance, we passed into the center of the palace itself, the Patio de los Arrayanes (“Court of the Myrtles”). The Patio de los Arrayanes (“Court of the Myrtles”). From the Patio, we passed into one of the most magnificent rooms of the palace: the Salón de Comares. Panorama of the Salón de Comares. This chamber served as the throne room of the sultans. Construction began under Yusuf I, but he never got to use it: he was assassinated in 1354. His son Muhammad V finished the construction and decorated the room with his own name. The ceiling of the chamber was worth a photograph of its own. 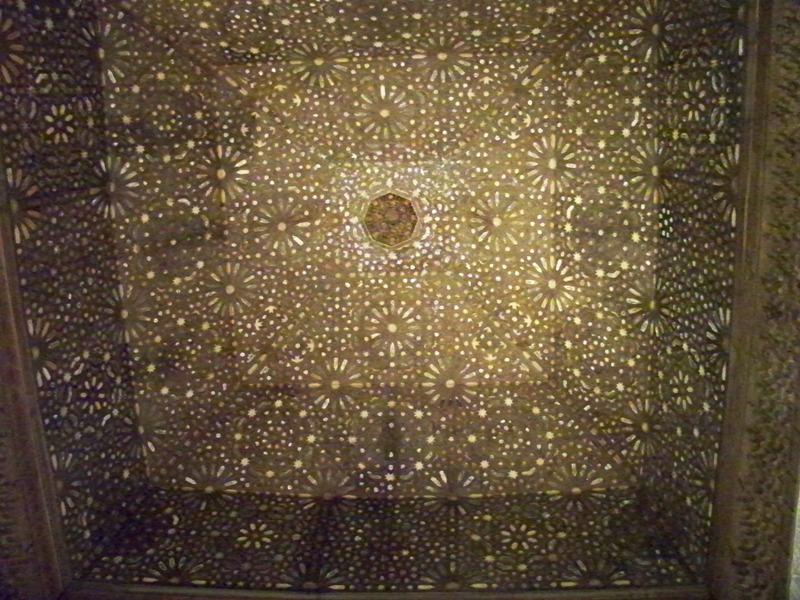 Ceiling of the Salón de Comares. From the Palacio de Comares, we moved into the third of the major palaces, the Palacio de los Leones. It was built by Muhammad V as a residential palace, and contains some of my favorite rooms. We passed first into the most famous part, the Patio de los Leones (“Patio of the Lions”). The Patio de los Leones. Unfortunately, as you can see, the Patio was under construction and not at its best! Nevertheless, it was amazing to see. The central fountain is fashioned of marble and rests on 12 outward-facing lions which are superficially similar but each have distinct features. As impressive as it is, the next room we passed into I found even more spectacular: the Sala de Dos Hermanas, the main hall of the palace. Panorama of the Sala de Dos Hermanas. The beautiful stalactite-like ceiling is a style of Islamic architecture known as Mocárabe. The hall is known as the “Hall of the Two Sisters” because of the two marble slabs that form the main part of the floor. 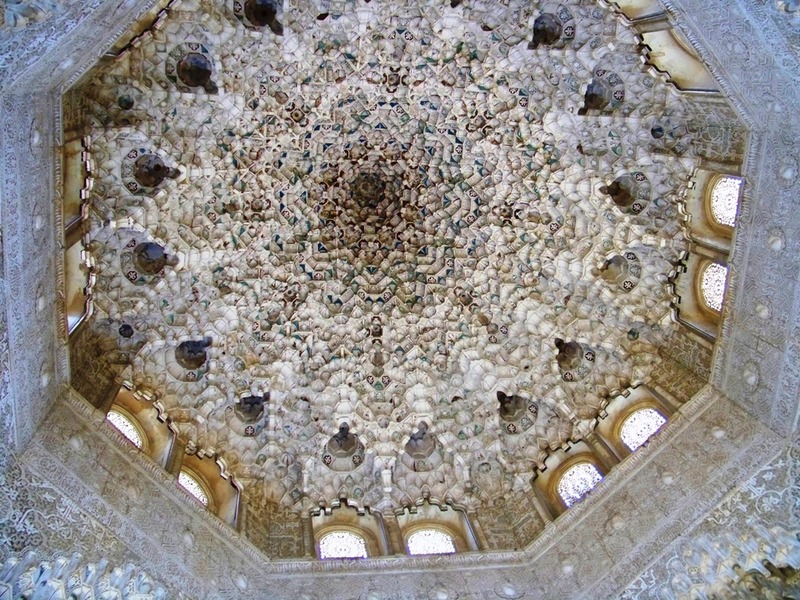 Ceiling of the Sala de Dos Hermanas. On the way out of the palace complex, we passed through one more lovely area: the Patio de Lindaraja. The central fountain is a relatively new addition, put in around 1626 by the Christian rulers who displaced the Nasrids. Our guided tour basically ended here; there was one other small bit of history worth noting. The American author Washington Irving (famous for “The Legend of Sleepy Hollow”), fresh off of writing a biography of Christopher Columbus, used his fame to negotiate an extended stay in the Alhambra in 1829. Irving was preparing a book titled A Chronicle of the Conquest of Granada, intended to document the history of the last years of the Reconquista. While staying in the palace, however, he was inspired to write a series of stories about it, which later became Tales of the Alhambra. It is said that Irving’s report on the deplorable state of the complex embarrassed the government into undertaking the eventual restoration. 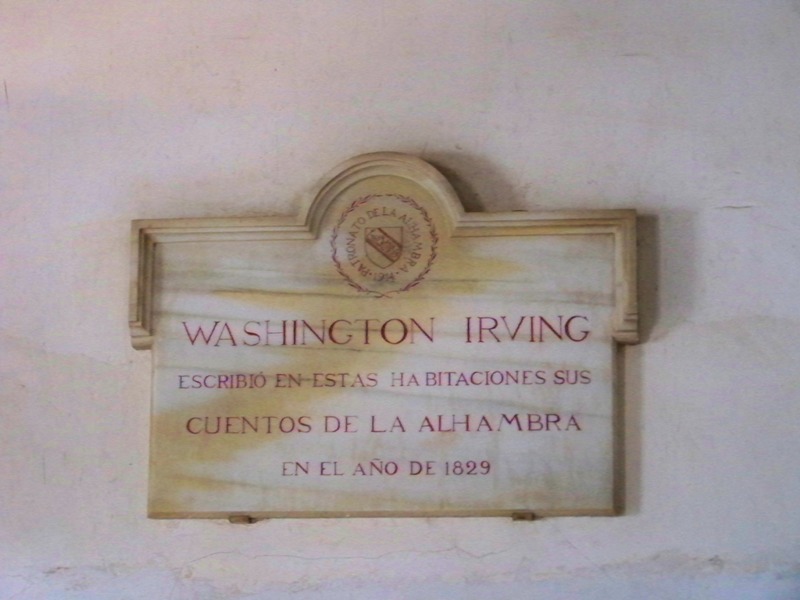 Plaque commemorating Irving’s stay in the Alhambra, placed in 1914. 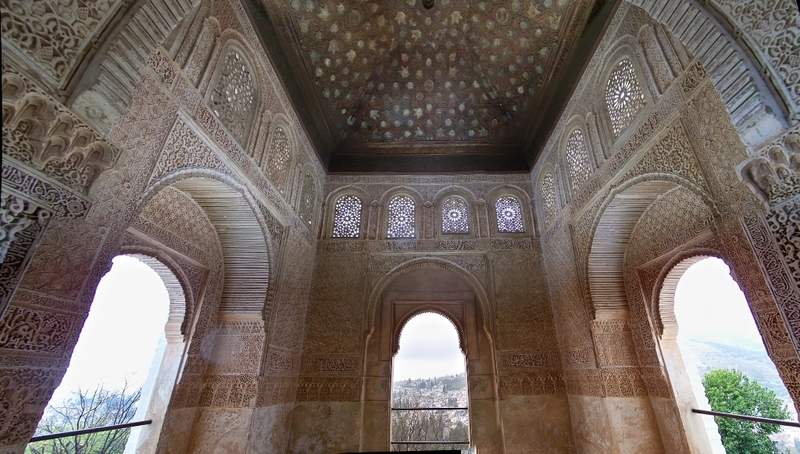 There is so much history in the Alhambra! As we made our way back to the exit, we passed the Church of Santa Maria de la Alhambra, built in the 17th century on the site of a former mosque. Church of Santa Maria de la Alhambra. We left the Alhambra and headed back to Granada to eat and relax. 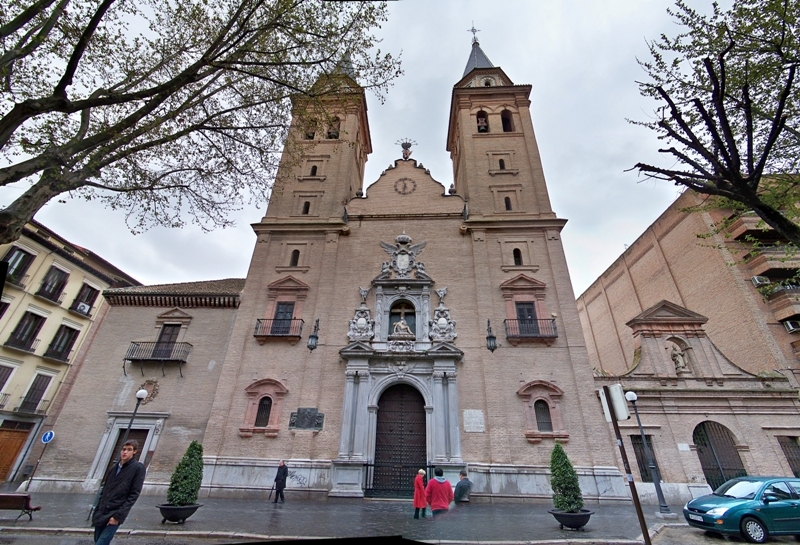 We passed one other noteworthy spot in the city center: a monument to Queen Isabella I, who unified Spain, completed the Reconquista and financed Columbus’ voyage to the New World. The monument features Columbus showing his maps and charts to the queen; it was constructed in 1892, 400 years after Columbus’ trip. 1892 Monument to Isabella I in Granada. After our visit to Granada, our trip to Spain was more or less over! The next morning we caught a train back to Madrid, where we spent the rest of the day. Our return to Madrid was somewhat anticlimactic, as it ended up pouring rain for most of the day (it even hailed for a brief time). In the end, exhausted, we all called it an early day and rested up for our flight back to the United States. 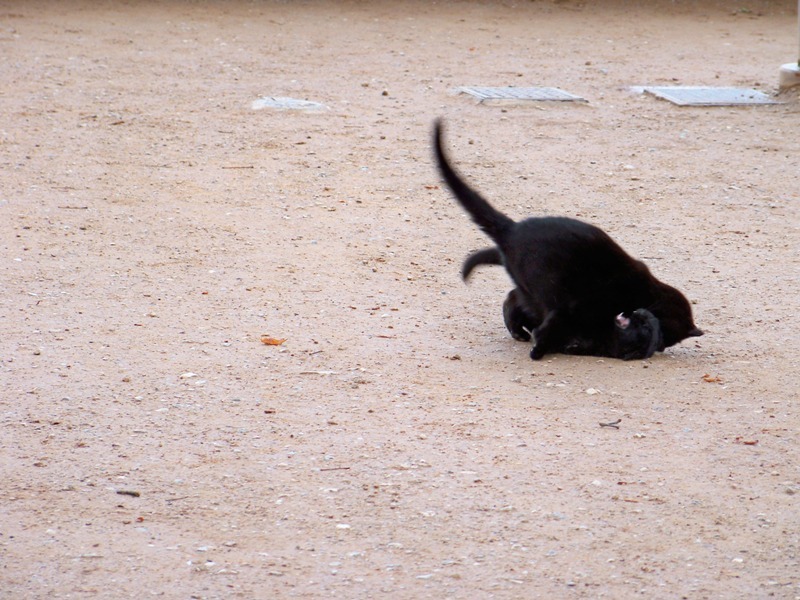 I hope you’ve enjoyed this photo travelogue of our trip to Spain! It was a beautiful country with so much to see and do; hopefully I will get a chance to return there one day. Gorgeous photos. I always wanted to visit the Alhambra. Thanks! Yes, it is definitely worth seeing. You and Beth should try the board game of the same name (Alhambra, that is). It won the 2003 Spiel des Jahres. Ha! I’ve seen the game in stores and thought about trying it.